Everyone knows the importance of a roof for protecting the interior of a building and all of the assets inside a structure. How do commercial and residential roofing systems differ? This is a question we often get asked, so we thought we would answer it in this article. Size. This one’s obvious, considering residential homes typically have 1,000 to 5,000 square feet or so. Many commercial businesses are tens of thousands of square feet, even spanning several acres in some cases. Of course the larger the building, the larger the roof. Our team is dedicated to providing outstanding repair, replacement, and maintenance services to our customers. Materials used for roofing projects also differ when it comes to commercial installation. Most homes have asphalt or metal roofs, some have slate, tile, or wood. Homeowners usually choose materials based on durability, cost, and aesthetic appeal, while commercial businesses are more concerned about longevity of the roofing system, its durability, how weather will affect it, and how energy-efficient it is. Materials used in commercial roofs include metal, modified bitumen, EPDM (ethylene propylene diene terpolymer), TPO or thermoplastic polyolefin, and BUR or built up roofing, sometimes referred to as “tar and gravel” roofs. 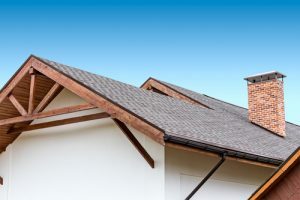 Slope or “pitch” of roof. Most residential homes have steep-sloped roofs which allow for water run-off. The majority of commercial or industrial buildings have roofs that appear flat, although they actually have a low-slope that’s capable of handling rain, snow, etc. The low-slope or “flat” design of commercial roofs make them more efficient and cost-effective for businesses. These are the primary differences between a commercial and residential roof, so now you know! Kelco Roofing has been a trusted Atlanta commercial roofing company for more than 40 years! Whether you have a business under construction or need your current roof evaluated to determine if repairs or replacement are in order, give us a call today.